Unlox – Unlox your Mac with your face, fingerprint or wrist. Unlox your Mac with your face, fingerprint or wrist. Every new macOS release brings new challenges for me as the developer of Unlox. Usually that challenge is around bugs in Bluetooth, but this year it’s a bit more challenging. This year Apple really tightened the restrictions 3rd party apps have to interact with other apps, which means now apps have to be given explicit approval to control things. Unlox will not be able to enter your password unless you grant access. The first time Unlox tries to enter a password, the system will prompt you to ask you to allow access. If you deny access then by accident, the system will never prompt you again and you must follow the manual steps above. EDIT: I’ve found a way to prompt for access on launch of Unlox which I’ll add in an update soon. I’ll continue to monitor the Mojave betas in case this changes, and I’ll try to make this process easier if at all possible in a future update. Until then, please share this with anyone you know who uses Unlox so that they can keep unlocking their Macs! Unlox (formerly MacID) 2.0.1 is now available. This is mostly just a bug fix update with focus on fixing a few issues that didn’t show up during beta testing or that I didn’t have enough info to fix until after 2.0 was available. Thanks to everyone who submitted feedback and took the time to forward logs on, it’s super helpful in getting bugs fixed quickly. Re-added the background app refresh option as requested by some users. Made it clearer which notification actions will launch the iOS/watchOS apps if your iOS device is not locked when Unlox sends a notification. Removed duplicated text in notifications, which is unnecessary and annoying for people who use VoiceOver. Made notification text shorter so that on Apple Watch you don’t have to scroll to get to the action button. Makes it clearer that you have to click your iOS device when it appears in the setup window. Adds a progress indicator while setting up rather than an indefinite spinner. Checks for updates on launch if you have automatic update checking enabled. Fixes an issue where autolock would tell you it’s disabled because you’re not on battery, even if you have autolock turned completely off. There has been some confusion around the upgrade bundle and how it works so I thought I would try and clear that up. Firstly, you must purchase Unlox through the bundle or Apple will charge you full price regardless of whether you already own MacID. Secondly, the search results for bundles ALWAYS shows the full price of the bundle. You MUST tap through to the details screen of the bundle to be shown the cost to “complete this bundle”. In my case the bundle charges me £1 because I bought MacID for £2.99 when I first launched it. Thirdly, if you got MacID while it was free or with a promo code Apple will charge you full price. And lastly, I’ve had some reports of people who have bought MacID through another bundle in the past being charged full price by Apple. There is no official way to charge for updates through the iOS App Store, so these bundles are the only way we can do discounts for people who already own the app. Remember that Unlox is only a separate app because of a really horrible bug with Bluetooth in iOS 11.0-11.2. All I can do is set a price for the bundle which is the same as what both apps cost in the App Store right now. This also means that if either of them go on sale the bundle disappears from the App Store. [Edit 2] Apple have now approved the upgrade bundle. You can find it on the iOS App Store (the bundle will be unavailable until Unlox is full price on the App Store). It looks like Apple are charging the difference between when you originally paid for MacID and the price it would be now. [Edit 1] Apple have rejected the upgrade bundle for not being descriptive, so I’ve added a better description and re-submitted the upgrade bundle. I’m really happy to announce that Unlox is now available on the iOS App Store! It’s been months rollercoaster emotions working on Unlox/MacID 2, but it’s finally here. If you’re wondering why MacID is now called Unlox, I’ve covered that in this post. It’s an emotional post, so get your tissues ready! It is with heavy heart that I must say goodbye to MacID, and hello to Unlox. After three years of MacID 1 on the iOS App Store, when it came to submit macID 2, Apple’s App Review team decided that this time around they don’t like the name “MacID”, because it has “Mac” in the name. Now, this was always a fear when I first launched MacID way back in January 2015, but after three years of them not mentioning it when updating the app, I never expected them to suddenly change course. I fully appreciate that “Mac” is a trademark of Apple’s which is why I have that on the website. I just wish this had happened in 2015, before MacID made its name and built up lots of SEO and fanbase around it. Being an independent developer is hard enough, so after being lucky enough to have an app as popular as MacID, it makes me really sad (and worried for the future) to have the name taken away from me. I think the main issue is that because it was a new app, Apple’s review team were more rigourous. Things could have changed over three years that made them clamp down on naming. Fine, but the only reason I really have to submit as a new app is because of their engineers pushing out buggy updates in the first place. I’m stuck between a rock and a hard place, and I opted for what I thought was a fair option at the time. Would I have to rename MacID if I just over-wrote MacID 1 and ignored everyone that wasn’t on iOS 11.2 or High Sierra? Who knows, but I think I wouldn’t have had to. So, now is the time to welcome in Unlox. Unlox is MacID 2, I’m just not allowed to call it MacID 2. So what’s new in Unlox? The design: MacID 1 has always been a pretty app but it’s really starting to show its age now, especially alongside iOS 11 and iPhone X. Unlox adopts a more native feel while still staying true to its gradient-full beauty which always gave MacID its unique and recognisable look. Ease of use: As MacID 1 became more and more popular, it became more and more complicated and difficult to use. The main menu was a bit of a mess and the iOS app started to get unintuitive to use. Unlox starts afresh, restructuring the most useful features into a more refined and simple interface. I’ve had to guess what features to redevelop first because I have no analytics in the app. Because MacID and Unlox have access to your password, your trust and privacy is incredibly important to me, so I have always opted for never having analytics. This is a trade-off for that privacy, so if Unlox doesn’t have a feature you use in MacID, let me know and I’ll add it back in if I can! Face ID: Along with a redesign and support for the iPhone X screen, I really wanted to make sure that Unlox properly supported Face ID. 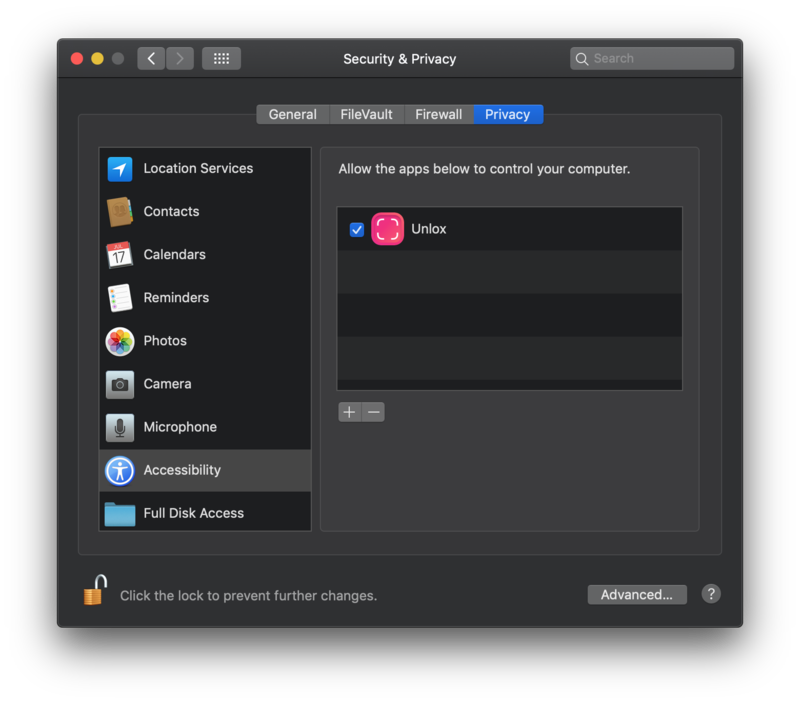 I’ve been taking special considerations for Face ID support; for example, making sure that if you have Unlox open while your Mac requests your admin password, Face ID doesn’t automatically scan your face and enter your password without you approving it first. Unlike Touch ID, Face ID doesn’t have a confirmation step by default. MacID was an amazing name, which was unique in the App Store and had a decent web URL available. To rename MacID, I needed something new that was short, easy to remember while being unique in the App Store and has a URL as good as macid.co. After a lot of looking round, I stumbled on Unlox, which (at the time of writing) yields no results on the App Store and has unlox.it available as a URL. I agree it’s not as good as MacID, but in my opinion, nothing will be. I want MacID to live on far into the future. If renaming it to Unlox is what it takes then I’ll do that. I re-wrote MacID to make it better and quicker to update in the future, so as long as I can get the new name out then Unlox will continue to do well. Any help you can provide to help me get the new name of MacID out would be so helpful and I would be incredibly grateful. Independent developers like myself rely heavily on the support from fans and blogs and we are eternally grateful for everything everyone does to help us. So one last time: goodbye, MacID, old friend. You changed my life.